Friends~This is a version of the ever popular BOO letter for Halloween. We always BOO our neighbors in the month of October. We copy a letter and sneak to their porch at night and drop off a bag of treats and run off into the night. I decided that why only have this sneaky fun in October! My kiddos and I put this letter together and 3 baskets full of Easter eggs and off we will go tonight to EGG our friends! 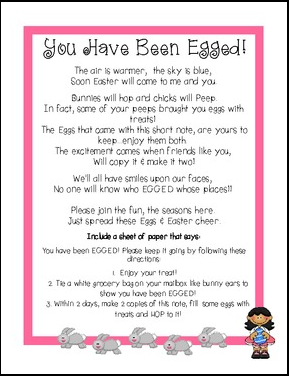 Join in on the fun by coping off this letter and filling some plastic eggs with candy and treats! I am thinking this might be fun at school too!